Hemostats are instruments used to reduce or halt bleeding during a surgery. These can be enabled by the use of smearing pressure, stitching the bleeding or using thermal energy devices. Hemostats generally are used to clot the blood during surgical procedures. Technical advancements have increased the usage of topical hemostatic agents in an extensive variety of surgical situations. Make it into a different sentence. New tissue sealants and hemostats in the market have addressed issue related to tissue contamination with previous sealants. How the new tissue sealants are addressing the previous sealant. New tissue sealants helps in reducing tissue contamination. Global hemostatic agents market is estimated to grow at a CAGR of 7.1% to reach $8,347.9m by 2022. The report analyzes the hemostatic agents market by type, by treatment and by end user. The market by types covered in the report are thrombin, gelatin, collagen, oxidized regenerated, fibrin sealants and combination hemostats. Fibrin Sealants are estimated to be the fastest growing hemostatic agents during the forecast period 2017-2022. The hemostatic agents market is also segmented by treatment which includes cardio vascular, general surgery, digestive and neuro-surgery. This report highlights the end users of hemostatic agents such as hospitals, surgery centers and nursing homes. The report estimates the size of the global market in value terms ($million). The report provides market size and forecast for APAC, Europe, Americas and RoW. A detailed qualitative analysis of the factors responsible to driving and restraining growth of the hemostatic agents market and future opportunities are provided in the report. 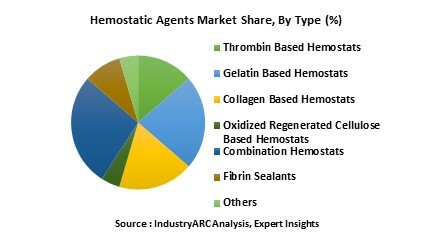 The report profiles thirteen key players of the hemostatic agents market.